If computers are an indispensable part of day-to-day activity in your company, it's necessary to provide each and every your employee with a computerized workspace. But why should you spend a fortune on company's computerization when you can connect multiple monitors to a single PC unit and equip workplaces for employees in a much more cost-effective way? IBIK company is ready to offer you a powerful multi monitor solution that allows you to organize several workplaces based on a single PC system. Our multiple monitor software ASTER was designed to help equip additional computerized workplaces in offices, libraries, Internet cafes, universities and other commercial and educational establishments. There is no necessity to use a terminal station or a thin client and buy expensive extra system units to share your computer. All you may need are additional monitors, keyboards and mouses. When you connect multiple monitors to a single PC, you get multiple workplaces on the basis of just one system unit that allows you to save a fortune on the equipment purchase and maintenance. In addition, ASTER multiple monitor software is designed to benefit your company in terms of diminished power consumption and lesser dose of high-frequency radiation. You may rest assured that with a flexible multi monitor solution from IBIK company, your users will enjoy completely independent computerized environments as if each of them had his own PC. 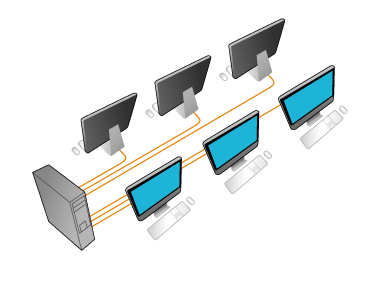 When running multiple monitors on a single PC, all common resources are automatically accessible from each station that makes it possible for all users to access the Internet and local devices such as printers, scanners, etc. without any hassles.